12" scrubbing path, 16 lbs. A small portable scrubbing machine that is perfect for deep cleaning on carpet spots and stains. 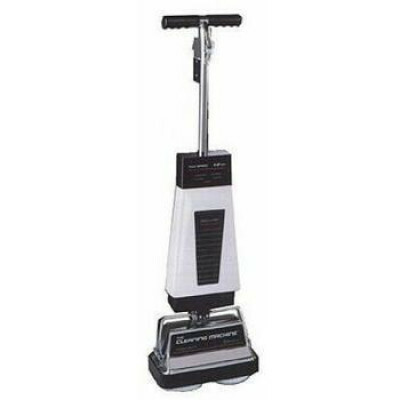 It can also scrub hard floors in small tight areas, and it buffs and cleans hardwood floors. The cost efficient way to clean large carpeted areas is to first remove the spots and stains with the Koblenz P-4000 portable scrubber, and then go over the entire area with a box style carpet extractor, without having to worry about cleaning the heavily stained spots. The portable scrubber comes with a set of white carpet brushes to start with, and other accessories are sold separately. Comes with a 1 year warranty on parts and labor. Please Note: If you plan on using one our felt polishing pads, floor scrubbing pads, tan cleaning pads or any other floor pad with this scrubber, you will need to purchase a pair of our floor scrubbing brushes to use as a pad driver. The bristles on the included carpet scrubbing brushes are not strong enough to properly secure any type of pad on this scrubber. Take a look at our complete line of rotary floor buffers for other options!! Comes with a set of carpet brushes to pre-clean carpet spots before doing a complete carpet extraction. So lightweight and compact that it can be left on site for small "touch ups" on carpets and hard floors. Uses the same scaled-down brushes and pads as large floor machines. Durable all metal housing, motor base, yoke, and handle. Cleans grout quickly and easily. Customers who were interested in the Koblenz P-4000 Portable Carpet Scrubber were also interested in the following items. I have marble and tile floors throughout my house. I use this product to clean my tile floors with the scrubbing brushes and the soft pads to polish my marble. Works great on my kitchen tile! I use this scrubber on my porcelain tile in my kitchen and it works great. I also use it to buff my hardwood floors and spot clean my carpets. Easy to change out and use. I love it. It does a great job. I like using my floor scrubber when I want to do deep cleaning and heavy traffic areas show up after a while I really need to scrub my floor it is much easier with this than on my hands and knees. I used this product to shampoo my family room carpet and it is beige in color. The shampooer really cleaned the carpet. My wife does not want to replace the carpet anymore. I'm really satisfied with the cleaning performance of this machine.I also used the machine as a buffer and my hard wood floor glow. This is a review for the Koblenz P-4000 Portable Carpet Scrubber .